What can be better than half-off sushi! I have been here many times and they have pretty good sushi, but their normal menu is on the pricier side. The service there varies, lately it has been good. Their selection of happy hour is small, but they are all full size. I believe the happy hour choices are Rock Shrimp, Crispy Calamari, Spicy Tuna Cut Roll, California Cut Roll, Albacore Tataki with Ponzu & Onion Chips, Crunchy Cut Roll, Spicy Tuna Tartare, and Crispy Rice Sushi. Word to the wise, I would not recommend the shrimp and calamari. Their batter has absolutely no flavor and the sauces did not compliment the bland flavor. My sister and I barely touched these appetizers. I LOVE the crispy sushi! A 3-piece order for only $3.75. How can you top that!?! Their crispy rice has just the right texture and consistency. 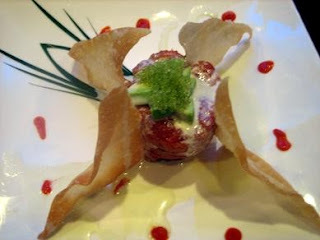 The spicy tuna is also quite flavorful and a generous amount is given on top. I will be back later today for Happy Hour again! Be sure to add the lemon to give it that extra kick! Another favorite of mine is the Albacore with the onion chips and ponzu. I am a big fan of Albacore with ponzu. Their sauce packs a punch and really compliments the onion chips. The only comment I have is that this dish normally is $11 and definitely not worth that amount. Even at $5.50 I am a little skeptical because the dish seems to only be two pieces of Albacore cut up. Fair warning, their sashimi portion is pretty tiny. The crunchy roll here is very popular and good. 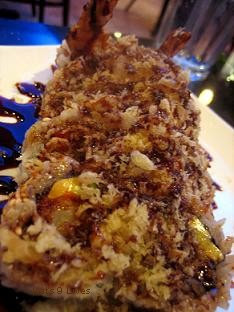 There are a lot of tempura flakes atop the cut roll with eel sauce drizzled all over. A common dish and a hard one to mess up. I am not a huge fan of spicy tuna normally, but I love it on the crispy rice sushi. My favorite spicy tuna is at Asakuma's! (which I will blog soon I promise!) So when I saw that this is one of the options for Happy Hour, I had to order it. The portion of spicy tuna is extremely generous. My sister and I thought that there was just too much spicy tuna around. I did like the tobiko, wasabi mayonnaise, and wonton but it was still lacking flavor. All I have to say is for half price, I am not complaining! Every time I come, I still have to order my regular nigiri to satisfy my appetite. Their Hamachi is normally pretty fresh and tasty. The Toro that they carry varies in texture. As you will see in the pictures that the first order was not as fatty and generous as the last order I got. Sadly I didn't start taking pictures until later on so the comments that follow will be without photographs. One thing I have to warn everyone is that I tried the Seared Jumbo Scallop with Tangy Miso and almost upchucked. The sauces were extremely awkward and left a horrible after taste. The grilled shitake mushroom had no place to be there. The flavors were all over the place and not in a good way. We ordered the Seared Yellowtail with Jalapeño Sashimi before and we were extremely disappointed at portion size. I actually really love yellowtail with jalapeño. It was good here but nothing special. They also have the Seared Toro with Ponzu, which was decent. The Toro is chopped up and then seared, which loses the buttery texture. I would recommend the Treasure Sampler that contains a piece of Albacore Tataki with Ginger Sauce, Ahi Tuna with Wasabi Sour Cream and Atlantic Salmon with Mild Miso Sauce. The Garlic Samler is very good as well. Their lunch sashimi combo is really nice for $13. Very fresh fish with 3 slices of each type of fish. One thing I have to complain about is at night, their sashimi combo does NOT include rice! I think that is ridiculous! Almost everywhere I have been give rice with their sashimi combos. I can understand that you don't get rice if you order a specific sashimi plate, but not when it is an assortment combo under all the other regular entrées they serve. The first time I came here, I ordered their combination dinners where you can choose from two categories. Word to the wise, it isn't worth it. The presentation is nice but the portion is tiny. It definitely is not worth the $14-$15. I also didn't think the food was that good, I would stick to their sushi. All in all I like this place. It is pretty good sushi for being on El Toro road. The city did a wonderful job re-modeling that area. Now that they have Happy Hour, I only come here from 5-6:30pm on weekdays. I can fill up on crispy rice sushi! It also saves me money since I don't have to order as much Toro and Hamachi. Definitely come here to try their half-off special! Love the crispy rice here! Even better at half price!